The cooler weather these past few days has basically been mother nature's way of saying fall is right around the corner. But before the brisk fall weather is here to stay, I've been spending more time on patios before it's too late! Ever since Chef Lindsay Porter took over the kitchen at El Cortez a few months ago, I've been meaning to stop by for eats on the patio. With the restaurant's proximity to Whyte Avenue, and the fact that it was a venue for Fringe shows, there was no better time than during the festival to have some pre-show dinner and drinks. Given the amount of shows I was taking in this year I actually made not one, but two stops at El Cortez. 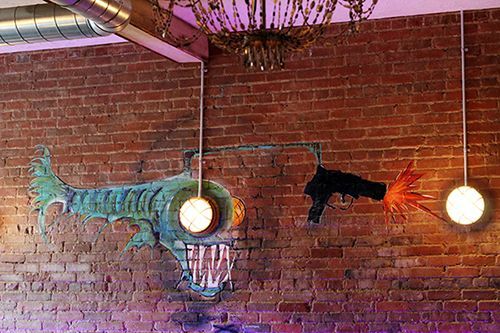 There's always been a lot of buzz about the unique design and decor at El Cortez. 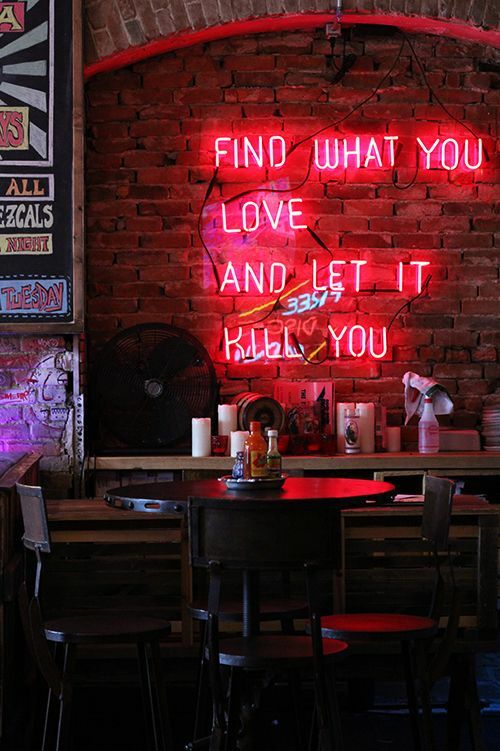 Chandeliers, neon signs, and graffiti-inspired murals adorn the walls, and once you're inside you forget that you're in the heart of Old Strathcona. On my first visit, my boyfriend and I arrived at about 4PM to a fairly empty restaurant, but given that the restaurant doubles as a bar I would assume business picks up as the evening goes on. 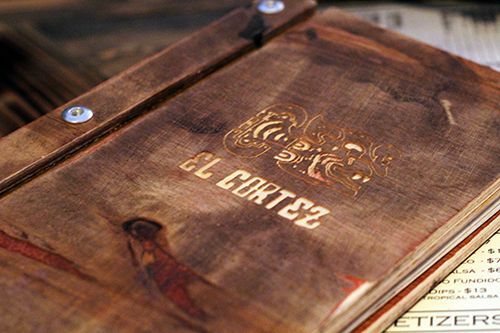 El Cortez has a fairly extensive menu, but there's a big focus on tacos and street-inspired eats. We happened to be there during happy hour (3-6PM daily) and ordered off the menu which features chips and dips, and a variety of small plates for $7.50 each. We started off with the 2 Feature Tacos ($7.50/2 - flavour changes weekly) off the happy hour menu, the tacos for the week were mahi mahi with a pineapple salsa. 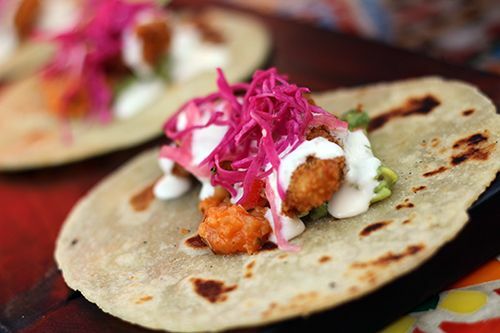 The fish was moist, well seasoned, and all the flavours in this taco worked well together. But what I really enjoyed was the house-made tortillas. These tortillas are thicker than most, but they have a nice crisp and slight chew, making them a solid base for all the tacos on the menu. Next up was the Swordfish Ceviche ($13) with tomatoes, peppers, avocado, chile and pico de gallo served with a side of spiced tortilla chips. The dish was full of fresh ingredients and had the right amount of acidity to bring out all the flavours. The dish could have been a tad more seasoned for my liking but otherwise was quite refreshing, and great for a hot summer day with a cold drink in hand. On the regular menu the Fried Queso Tacos ($14/3 tacos) caught my eye. Who can resist fried cheese? Not me. 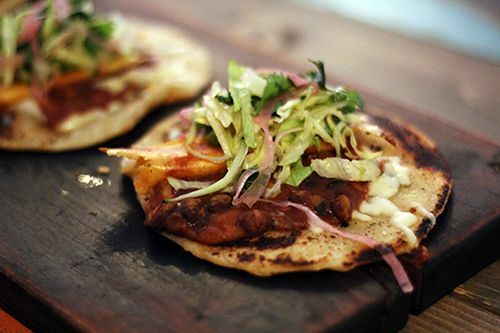 The taco was quite substantial in size given the amount of ingredients and the excellent house-made tortilla. Chewy cheese, combined with mushrooms, lettuce, onions, beans and guacamole made for a pretty standout taco that I wouldn't hesitate to order again. I was pleasantly surprised by this first visit to El Cortez. The food was great, service was attentive, and it was a great environment to be in just to relax and enjoy the summer afternoon. A few days later I stopped by again for some sunshine and eats on the patio. You would never know by standing outside of El Cortez that there's a great patio in the back of the building. A spray painted mural is accompanied by mosaic tiled tables and coloured accents throughout the space. It's an inviting atmosphere where small bites and cold drinks are perfect under the warm sun. 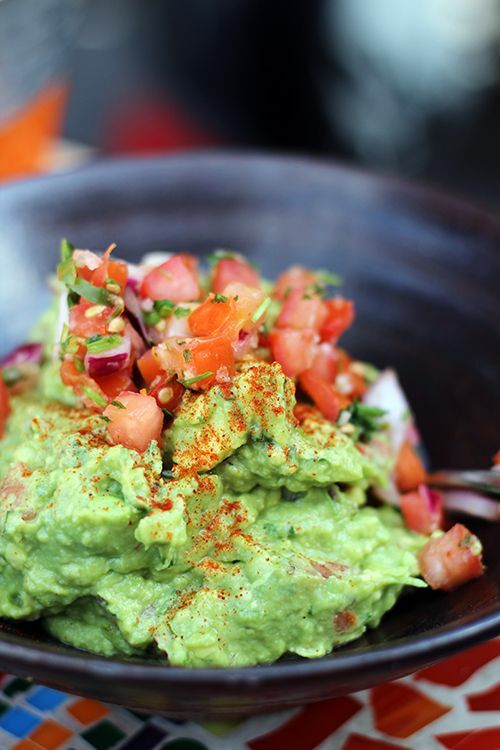 Again our visit was during happy hour, so we ordered the El Cortez Guacamole ($7.50) off the happy hour menu to start. The kitchen's version of guacamole comes as a substantial portion and is pretty close to perfect for me. 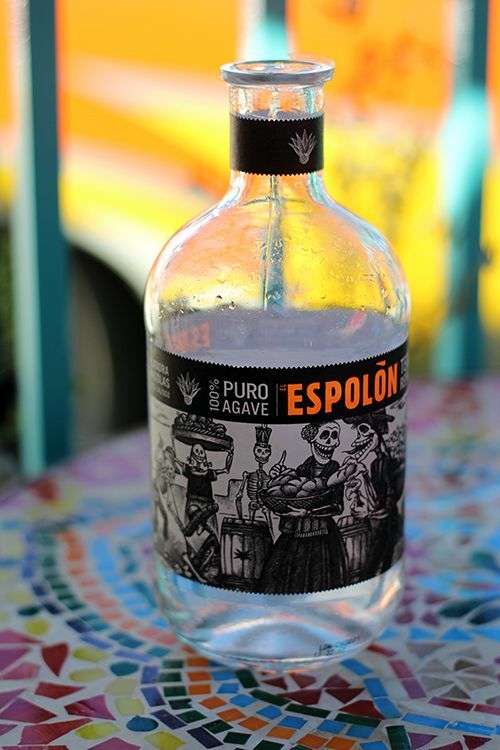 It's chock full of tomatoes, has great acidity from fresh lime juice, is well seasoned and has a slight kick of heat. The guacamole is quite addicting and I almost couldn't stop eating it. 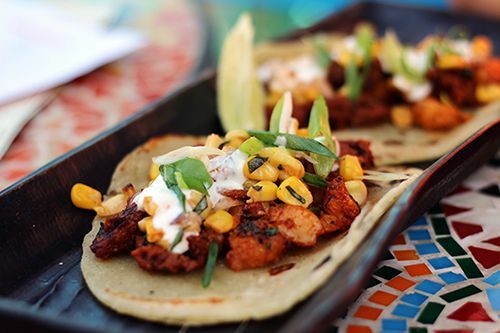 Next up we ordered the feature Cajun tacos ($7.50/2 tacos) made with sauteed prawns, chorizo, and a corn basil salsa. 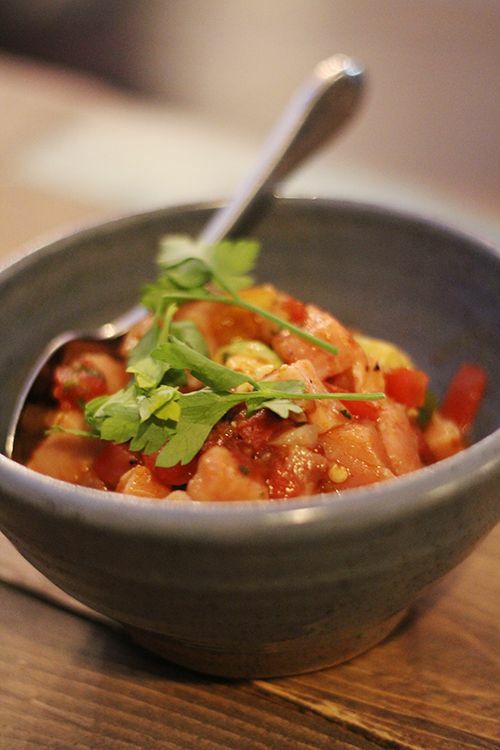 The prawns were perfectly cooked and there was a great balance between salty, sweet, and spicy. With a quick squeeze of lime juice these flavour-packed tacos became my favourite of the meal. I had my eye on the Crispy Pescado Tacos ($16/3 tacos) off the regular menu, so they became our last dish that afternoon. A crispy fried piece of fish was served together with shrimp salad, slaw, sweet chili Valentina glaze, crema, avocado, and cilantro. While the ingredients tasted great together, I felt that the tacos were lacking in substance. There wasn't much in terms of ingredients, and the tortilla looked quite bare with the spare number of toppings. A bit more fish and this one would have been great! 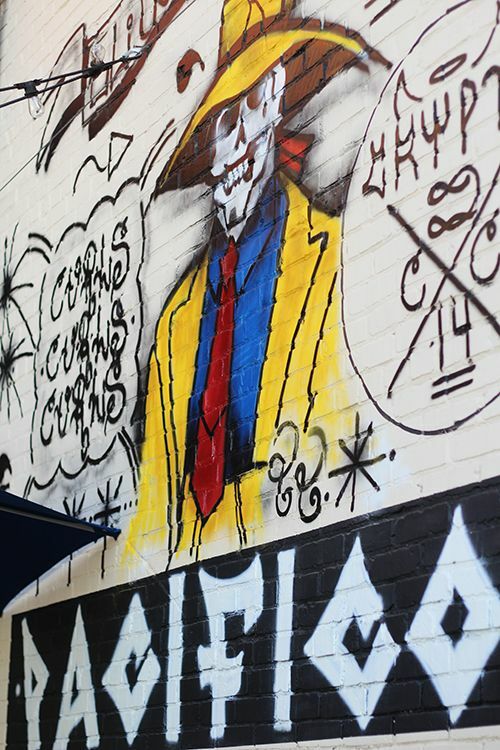 With two visits to El Cortez in a week, this is on my list of my go-to spots for quick bites! 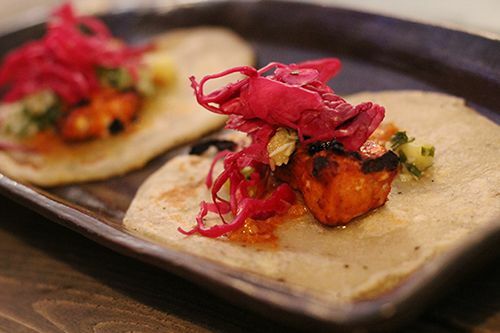 It's a great option for Mexican food south of the river, and I would definitely recommend stopping in during happy hour for some very affordable eats. Chef Lindsay Porter has done a great job with the menu overhaul and I'm definitely looking forward to trying other dishes on the menu. Unfortunately for me, I only ever have cravings for Mexican food in warm weather, so I'm going to have to get my fix before fall comes. If you're anything like me, head on down to El Cortez for some tacos and cold drinks before saying goodbye to summer until next year!